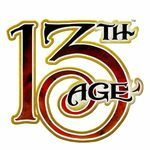 13th Age is the new d20-rolling fantasy roleplaying game by Jonathan Tweet (3rd edition D&D, Over The Edge, Everway) and Rob Heinsoo (4th Edition D&D). It's a familiar fantasy game with spell books, Armor Class, dungeons, hit points, portals to other worlds and owlbears ripping people’s arms off. But it’s also a story-focused game where every character is unique, relationships are their most powerful resource and failure is more interesting than success.